Wal-Mart Stores, Inc. (NYSE:WMT) is the largest discount retailer in the world. The company has generated $485.6 billion in sales over the last 12 months. Wal-Mart has profits of $15.5 billion in the same time period. Wal-Mart generates 70% more sales than Costco (COST), Amazon (AMZN), and Target (TGT) combined. Wal-Mart generates 192% more profit than Costco, Amazon, and Target combined. Only Target has a higher profit margin than Wal-Mart of these large discounters. The table above clearly demonstrates that Wal-Mart operates on a different scale than its rivals. 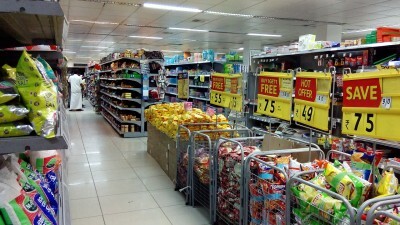 Despite being the undisputed industry leader, Wal-Mart is the cheapest of these businesses. Amazon doesn’t have a price-to-earnings ratio, but even if it was profitable, it is trading at a lofty valuation. Click here to see Wal-Mart and Amazon compared in detail. Target currently has a price-to-earnings ratio of 15.1, and Costco has a price-to-earnings ratio of 25.2. Compare this to Wal-Mart’s price-to-earnings ratio of just 13.4… Wal-Mart looks cheap compared to its peers. Another reason why we are interested in Wal-Mart is that billionaires Warren Buffett and Bill Gates are the top 2 holders of the stock in Insider Monkey’s hedge fund database. 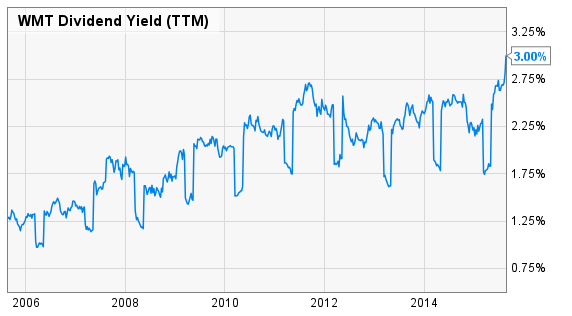 The image below shows Wal-Mart’s dividend yield over the last decade. As you can see Wal-Mart has never had as high a dividend yield as it does now. The company is currently yielding 3.0% – well above the S&P 500’s dividend yield of 2.2%.